The year was 2008 and the Apple iPhone was an AT&T exclusive. Verizon customers were demanding a phone with the same capabilities as Apple's smartphone, but all Verizon could offer them was the LG Voyager, a feature-rich handset that was not a smartphone and not the "iPhone killer" that it had been proclaimed to be. Meanwhile, at RIM HQ in Canada, the co-CEO's still considered the iPhone to be a fad, something that enterprise-centric RIM would have nothing to do with. Jim Balsillie, one of the two top executives at RIM, held on to his belief that typing on a touchscreen would never replace the kind of physical keyboards BlackBerry was famous for. "As nice as the Apple iPhone is, it poses a real challenge to its users. Try typing a web key on a touchscreen on an Apple iPhone, that's a real challenge. You cannot see what you type." Meanwhile, the other CEO, Mike Lazaridis seems as though he was in denial when he stated, "The most exciting mobile trend is full Qwerty keyboards. I'm sorry, it really is. I'm not making this up." 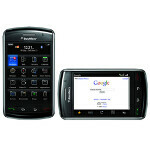 Early 2008, rumors that a touchscreen Berry would launch on Verizon called the BlackBerry Thunder. This eventually became the BlackBerry Storm and while it would not have a physical QWERTY keyboard, it would have a technology called SurePress that was supposed to mimic the feel of pressing on a real button. Expectations were high and RIM produced a series of commercials with each one showing a little bit more of the screen than the prior one. Verizon customers were hoping that this device would be their iPhone and by the time the phone launched on November 21st, there really was excitement in the air. Once launch date came, the excitement left fast. The phone came to market with half baked software, a buggy accelerometer, and a way over-hyped SurePress keyboard. RIM had overpromised and underdelivered. But the problem was the nonchalance attitude of the top executives at RIM. Still believing that touchscreen was a fad, they hadn't bothered to even include Wi-Fi on the Storm. Co-CEO Balsillie even told smartphone buyers to expect all phones to come out of the box with bugs. We do not expect the same thing to take place now. RIM appears to have a focused and capable CEO on its hands in Thorsten Heins. BlackBerry 10 appears to be compeitive in every way, from what we can see so far. While the BlackBerry Storm experience might have left a bad taste in the mouths of many, the truth is that RIM had to go through it so it could come out the other side looking as it does now. The pressure is higher now than in was in 2008, with the whole survival of the company at stake. Let's just say that RIM survived that Storm and for now, is still around to tell the tale. I remember saying this a week ago. BB10 will no doubt mark the end of RIM. why didn't you become a marketing analyst ? Not necessarily. I'm not holding out high hopes for Blackberry, but BB10 has potential as long as the feature set is there and it's not a buggy pile of s**t like the Storm was on arrival. 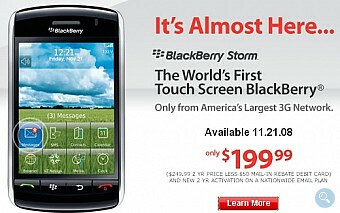 Furthermore, Blackberry still has the richest email interface out of all of the smartphone platforms. I can see Enterprise customers welcoming Blackberry back, at least. Well I turned out to be right. BB10 did mark the end of RIM as they are now changing their name to Blackberry. Didn't even know it is introduced today, and that says more about RIM than about me sorry to say. Nokia Lumia tablets would be the best ever hardware tablets of all the time. Thats funny because I had that phone. I think I still got one in the box in my closest. Ah, the days of what we thought an OS could or should do back in the day.